Vermilion County Sheriff's Deputy Patrick Alblinger and Illinois State Police Master Sgt. Mike Atkinson (right) talk about the area's meth problem. 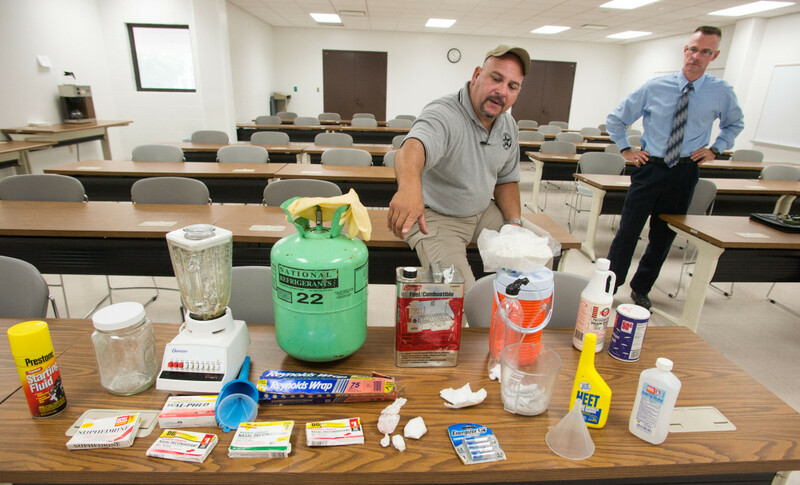 In the photo, they show examples of lab components on Monday, Sept. 30, 2013. The number of methamphetamine labs in central Illinois is on the rise, according to Illinois State Police records. And in past years, that would mean farmers and agriculture producers would have to keep their anhydrous ammonia – a popular nitrogen-based fertilizer that doubles as a key ingredient in meth – on lockdown. Meth is often made by using a collection of different household materials, which sometimes include lithium batteries, starter fluid and Coleman fuel. The "shake-and-bake" method requires cheap plastic bottles such as the one shown in the photo. But a shift in the way meth producers cook their drug has drastically decreased the need for anhydrous ammonia. In turn, anhydrous ammonia thefts are becoming less common. In fact, McGuire said many farmers have experienced such a small number of anhydrous ammonia thefts that they no longer worry about preventing them. The cost of the amount that would be stolen doesn't outweigh the cost of installing security, he said. Instead of using anhydrous ammonia in their cooks, meth producers have started using a method called the “shake-and-bake” method where anhydrous ammonia is produced naturally during internal chemical reaction processes. The shake-and-bake method involves using cheap plastic two-liter bottles. Before the shake-and-bake method, meth producers stole anhydrous ammonia from agriculture and refrigeration sites. McGuire said that, in the past, the majority of seized meth labs were run off of stolen anhydrous ammonia. 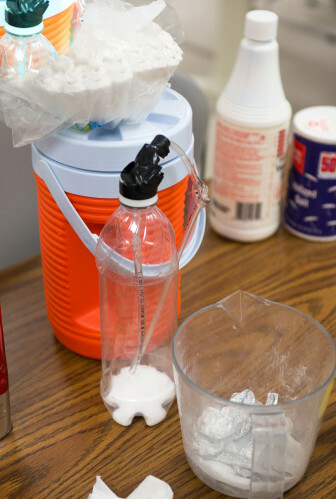 During robberies, users would only steal a couple of quarts for smaller-sized meth cooks, but they would waste and vent a couple of gallons from the tanks in the process. More significantly to farmers, they would cut and ruin fences to get to the tanks, while also damaging valves and cutting hoses. Anhydrous ammonia thefts do still happen occasionally, however. Since 2004, at least 80 meth labs seized in the state of Illinois have involved anhydrous ammonia, according to police data. In August, a man was arrested after police caught him trying to steal anhydrous ammonia from a Jonson County, Ind., farming co-op. In July, three men in Valdosta, Ga., were caught stealing thousands of dollars’ worth of the same chemical from a local packing company. In May of 2010, two men in Champaign County, Ill., succeeded in stealing the chemical from a Penfield fertilizer supplier, but were eventually arrested by police.